The contrasting landscapes of the rugged Kimberley, from its spectacular coastline to its rich mineral fields, will amaze and delight you on this extensive northerly expedition. Cruise on rivers and gorges, hike to waterholes, tour working mines, relax on pristine beaches and stay in safari-style accommodation. Discover the ocean at Broome, Coral Bay and Monkey Mia, and the stunning Outback landscapes of the Pilbara. FREE^ one way economy airfare to Darwin & return from Perth. 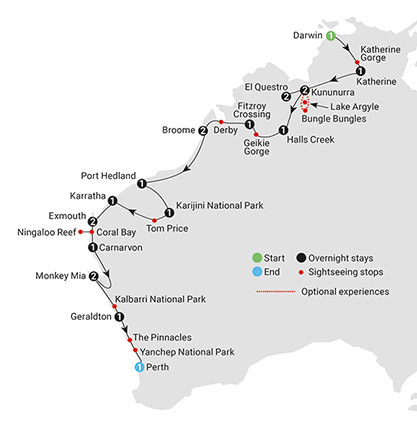 21 day/20 night Untamed Kimberley & West Coast tour including quality accommodation, experienced Travel Director & Driver Guide, luxury coach transport, airport transfers, daily breakfast, 2 lunches & 17 dinners. Indulge in food and wine on Darwin’s waterfront. See the entertaining Katherine Outback Experience show. Explore Hidden Valley (Mirima) National Park. Experience the Ord Valley’s gourmet produce. Visit WA’s only rum distillery. Visit an art gallery featuring Indigenous artwork. Get up close to the dolphins at Monkey Mia. Discover WA’s famous wildflowers at Kalbarri (seasonal). Delve into indigenous culture at Yanchep National Park.